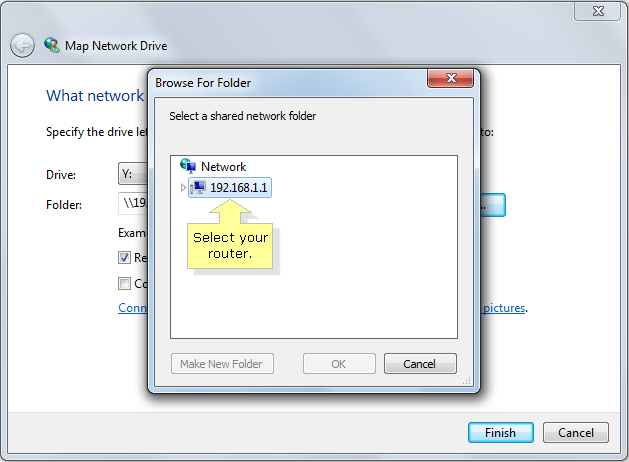 Network drive mapping is configuring a file folder on a computer to share files or folders of data over a Local Area Network (LAN). 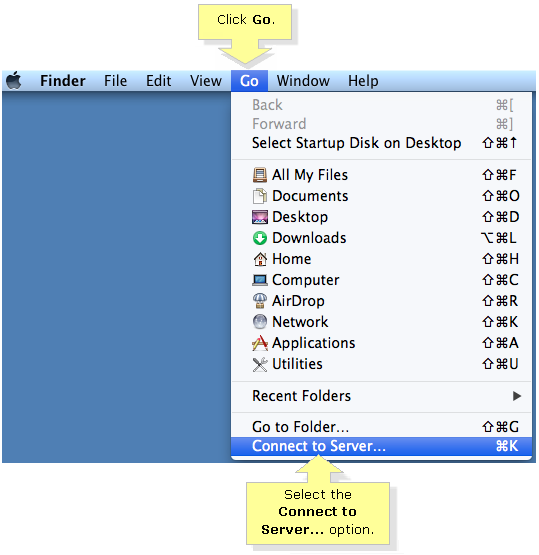 This is configured on computers that want to access a USB storage device or Network Attached Storage (NAS) connected to a router. 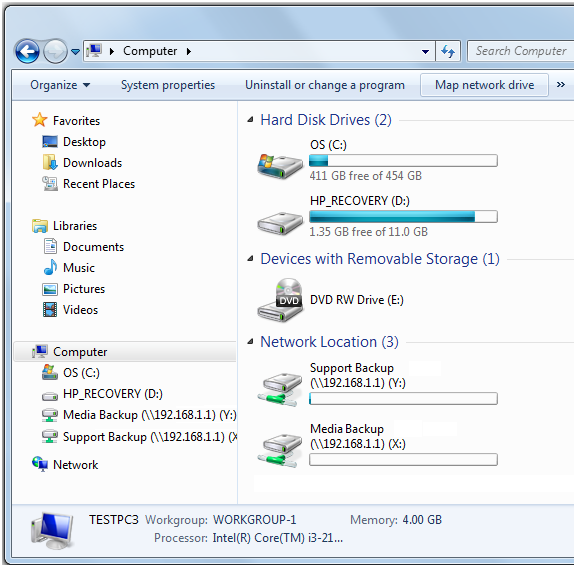 This article will guide you on how to map a network drive or a network storage device. Ensure that you have already identified your router's IP Address before mapping (the IP Address of the USB Storage and that of the router are the same). The default IP Address of Linksys routers is 192.168.1.1. 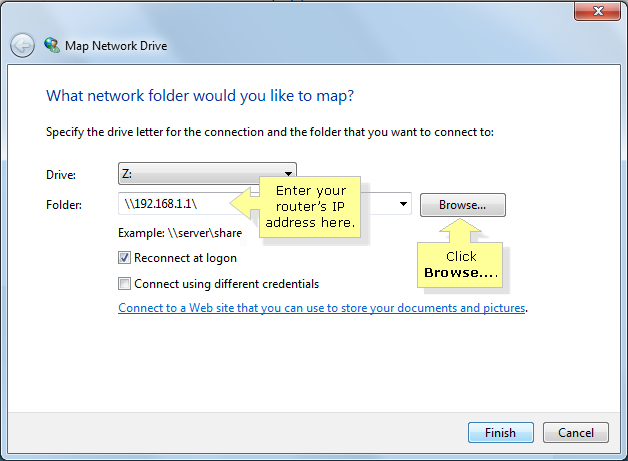 To learn how to identify the IP Address of your router, click here. If you are connecting to a Network Attached Storage (NAS), you need to know its IP Address. 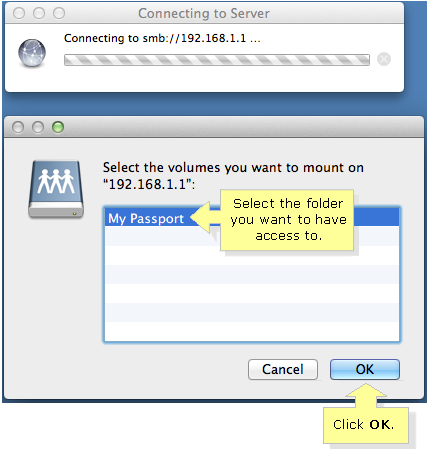 By default, the IP Address of a Linksys Network Attached Storage is set to 192.168.1.77. NOTE: These steps are applicable to Windows XP, Windows Vista®, Windows 7 and Windows 8. 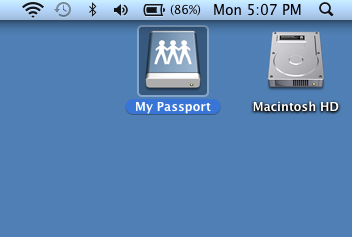 In this example, we used Windows 7. Enter the IP Address of the Network Attached Storage or the router with USB storage device and click the Browse… button. Double-click on the IP Address of your router. 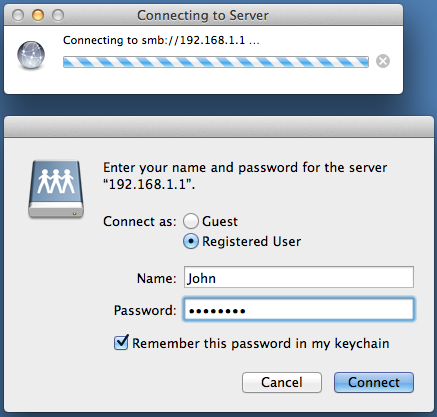 QUICK TIP: If you have set up specific shares to users, you will be asked to log in using your Username and Password. Enter their credentials here and click OK. To know more about configuring user access for your USB storage device on a Linksys router, click here. 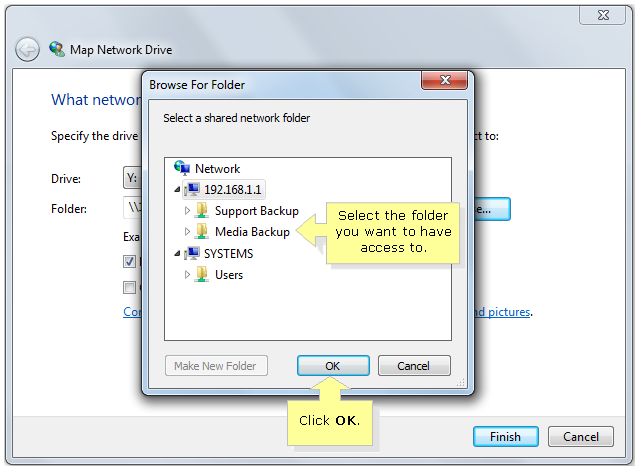 QUICK TIP: If the USB Storage device or Network Attached Storage is partitioned, you will see different folders under the IP Address you selected. 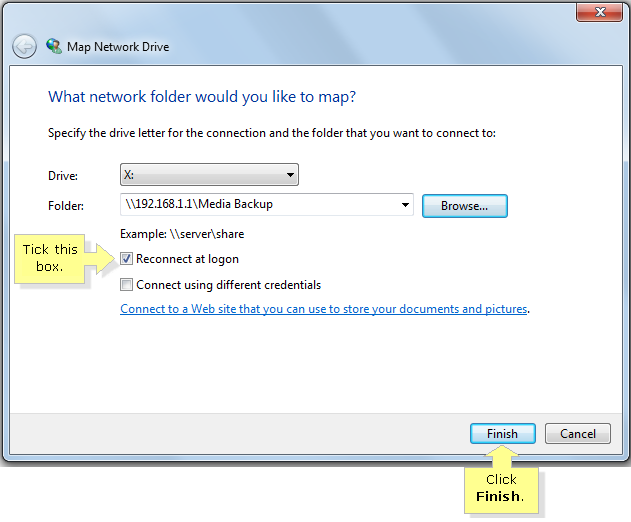 NOTE: Tick this box if you want to have the mapped network drive always available in the Computer window. 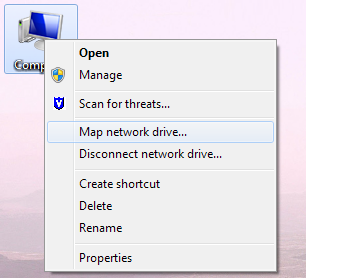 If you leave this unchecked, the drive will be automatically unmapped once you turn off the computer. QUICK TIP: Repeat the same steps in Mapping network drive to add more folders from your USB Storage device or Network Attached Storage. 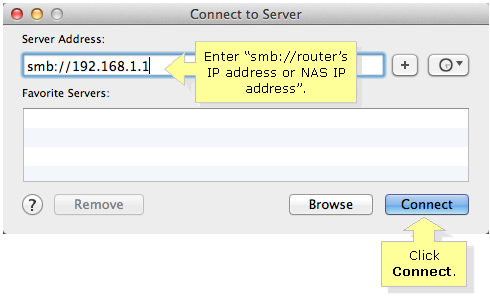 Under Server Address, enter “smb://router’s IP Address or NAS IP Address” and click Connect. 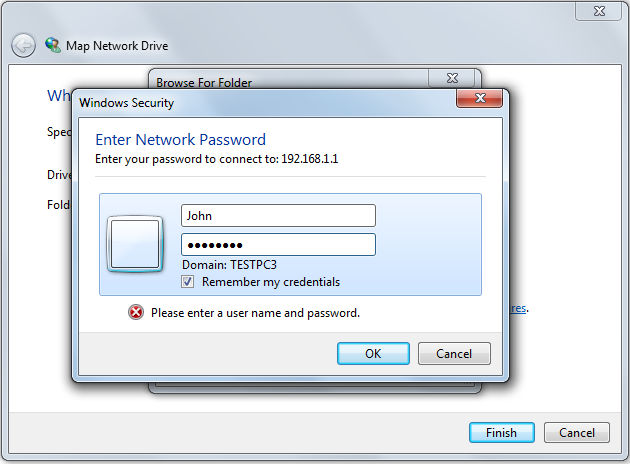 QUICK TIP: If you have set up specific shares to users, you will be asked to log in using your Name and Password. Enter their credentials here and click Connect. To know more about configuring user access for your USB storage device on a Linksys router, click here. 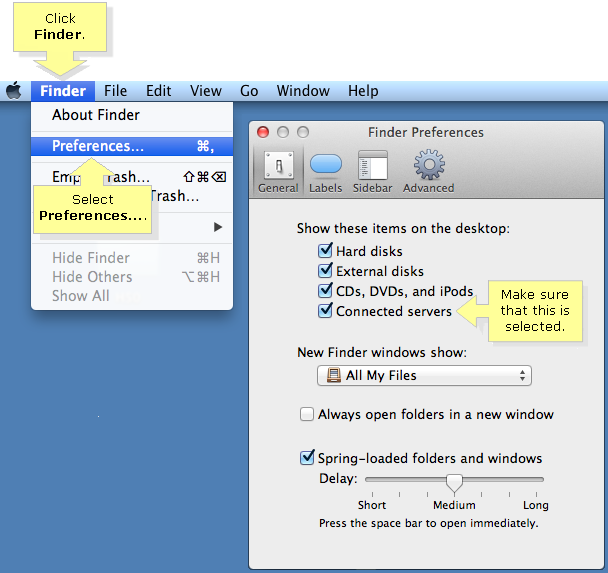 QUICK TIP: If you cannot see the icon for your USB storage on your Desktop, click Finder. Select Preferences… and make sure that the Connected servers is selected.